Vampires are on the attack. It's like watching a prostitute on her back. 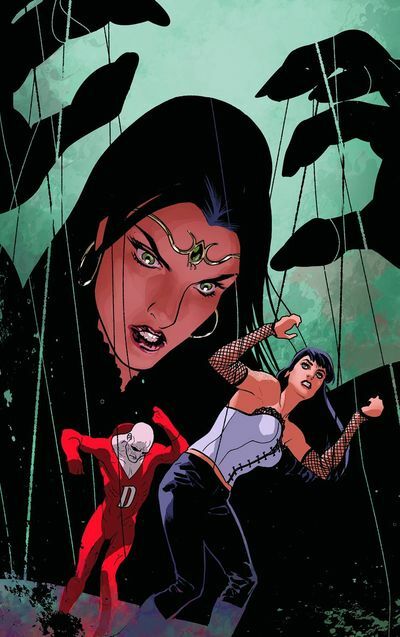 Deadman gets frisky - Zatanna thinks it's risky - and John takes a shot at her crack. Ohhh! Too crude? Then please blame Writer: Peter Milligan; Artists: Daniel Sampere and Admira Wijaya; plus Publisher: DC Comics in April 2012. In part one of this 'I, Vampire' crossover event, entitled 'Rise of the Vampire', we see our not-so merry band of mangy mages, thrust into a very biting adventure full of heroes, villains, and a possible savior. THE HERO: Under Madam Xanadu's advisement, Shade the Changing man transports her and 'the gang' to Gotham City, so they can now investigate the repercussion of Andrew Bennett's death, which inadvertently caused a shed load of Vampire's to spring forth and multiply. Still, is this a good thing or what? Maybe to Batgirl; because she is presently foot deep with a few of these members of 'the Un-dead'. Moreover, so too are the members of Justice League Dark as well. Err? Kind of. THE VILLAIN: As soon as Madam Xanadu spots the culprit behind this Vampire attack, Cain, she leaves her corporal shell, allowing for 'the team' to fend for themselves in her wake. Granted, some are more willing than others to pitch in with this battle, aiding Batman and company with a smack and a flick. Whilst some of the others, mainly Deadman and John, decide to figure out what Xanadu is up to. THE POSSIBLE SAVIOR: In the astral zone, Xanadu speaks to some fat Buddha crystal chap about an up and coming fateful endeavor. And trust me, it does not sound too promising I can tell you. I could not help but laugh when John Constantine took the p*ss about the bad condition of Gotham City in this Vampire attack, stating "What an absolute toilette. It reminds me of Manchester". Now for those of you who are not too familiar with this Northern British location (i.e. the Yanks or the Spanish), think of it as somewhere like Bilbao (Spain) or Pittsburgh / Castro Valley (USA). Just like most of the previous issues in this series, this one was also a really fun read throughout. Though, if I had to pick out one defining aspect which was better then the rest, I would have to say that I loved the team's dynamics more than usual - especially this John / Deadman part of it. Why is Shade the changing man starting to sound madder and madder without any real detailed explanation given? OK, I know that his 'M-Vest' is on the blink or something, and that he is yearning for companionship too. But what about his continuous sullen state? Does he need happy pills or something? If so, can writer, Peter Milligan, please give him some? STORY: One of the most jovial, interesting, and creative aspects of this tale, was the concept behind Deadman possessing a Vampires body. Well, it is kind of surreal if you think about it - a 'Deadman' possessing a 'un-deadman' - and a very innovative concept as well. I also liked that crystal Buddha man at the end of this story. Though I have to say that I have no idea who he is. Anyone got a clue? ART: There were two artists on this book, Daniel Sampere and Admira Wijaya, and both of them were just brilliant. OK, I have to admit, I preferred Admira's work at a touch; because it has that 'Army of Darkness' film poster vibe about it. Daniels did a good job as well, and was slightly more earthier if truth be told. CRYSTAL BUDDAH: Fair enough, I am sure that most of this bug guy would have to be done in CGI or something. But I would truthfully like to see Sammo Hung also habit this role, just for the sake of seeing him on the screen in a different way. CAIN: I might be slightly off with the age, but I always felt that Christopher Walken would make for a great King of the Vampire's. Can't you just see him talking the way that he does, to all of those reality-show wannabe's who are brain dead? Lovely. The Dead Walk Amongst Us Once More, Welcome to 'X-Factor'. I think mainly because I mentioned the film 'Army of Darkness ' in a previous answer, I might as well continue the motion with this answer too. Well, it beats thinking of something else I suppose, like an un-dead person would, ha! Prior to picking up this issue, I wasn't really bothered if I should buy the second part of this crossover, in 'I, Vampire', all that much. However, now that I have read this instalment, and genuinely liked this instalment, I still won't buy it up, instead, I'll have a quick read of it when I am at the comic shop next week, ha! Seriously though, this series is a good one. And I have very high hopes for its future too. A class act.